Seafront hotel provides outstanding views and service! 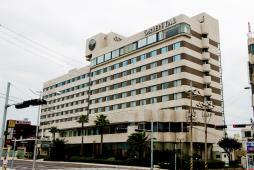 Jeju Oriental Hotel is a first class hotel and is closest to the airport among other first class hotels in Jeju. The ocean view from a room which was renovated in 2002 is truly amazing! Promenade and park located along the coast is ideal for a walk! With a well-established service, the hotel is supported by both business travelers and tourists. It is only 10min taxi ride from Jeju Int’l Airport! The location is very convenient. There is a large supermarket ‘E Mart’ across the street and there are many sashimi restaurants and local food restaurants offering the taste of Jeju around the hotel. The hotel offers a variety of restaurants such as buffet, Japanese, Korean and western to welcome all range of customers. Hotel also offers various facilities and entertainment such as casino, bowling alleys, sauna and internet room to accommodate both tourists and business travelers. The hotel boasts 313 rooms with a selection of standard, superior, deluxe and 4 suite (royal, ocean, Halla, junior). Bathrooms in suite rooms are designed especially large. The view of the emerald blue ocean and the sun setting over the edge of the horizon from ocean view rooms (subject to payment if requested) are superb.